I inhaled into my snorkel and adjusted my mask to get a clearer look at the six-foot reef shark swimming straight toward me below the surface of the water. The sunlight filtering through the top layers of the ocean illuminated the whiteness of his jaws, revealing the serrated edges of dozens of rows of teeth. I knew that he saw me, that he sensed me. I started kicking my fins once more and extending my arms in front of me, propelling me closer and closer to the shark with each stroke. I was off the coast of Bimini, the westernmost island in the Bahamas, and we were in open ocean: no cage, no wetsuit, no handlers. “Sharks are the puppies of the sea,” the captain, Neil Watson, had announced, moments before I jumped in the water. The founder of Bimini Scuba Center, Watson was busy chumming the water with lionfish carcasses while trying to convince the 40-plus people stranded on two boats in the middle of the Caribbean that sharks were harmless. He should work in shark PR. I was in the Bahamas with friends for the Woody Foundation’s annual Lionfish Bash, which raises funds and awareness for paralysis and other disabilities. We’d spent the past few days spearfishing lionfish, a venomous and invasive species destroying the coral reefs. 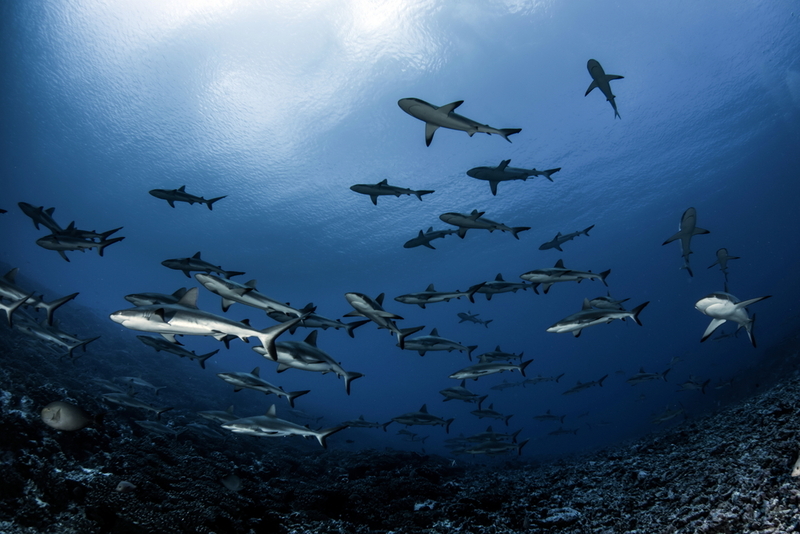 Dozens of sharks began to frenetically circle the water between the boats, expectantly waiting to be fed once again. I was one of only a handful of people aboard a tiny motorboat that was bobbing up and down in the waves. The vessel was barely larger than the increasingly aggressive sharks, who kept drawing closer to the starboard side, near enough to touch. Watson began shouting reassurances from across the water — he was with the rest of the crew in a large, covered boat, aptly named Dive God: “See, sharks aren’t bad. They’re just misunderstood.” The man should really work in shark PR. I felt an oncoming rise of nausea — we’d been at sea for nearly two hours, and I was beginning to feel increasingly dehydrated and perilously hung over. But no matter how much I was suffering on that boat in the 95-degree heat, I would certainly suffer more in the ocean with the sharks. I had no choice. The rest of my friends were on the larger boat, and they didn’t have to jump in first. I’d opted for the smaller boat so I could work on my tan — and I was about to die in the name of a solid base. I looked down at my purple polka-dot bikini — the bright color and pattern was a magnet for sharks — and felt like bait. But I surprised myself when I found myself heading for the stern of the boat, slowly climbing down the ladder steps. I was either going to die of sun and alcohol poisoning on the boat, or be killed in the water by sharks, I thought. At that point, I really needed to get out of the heat. I was the first one in the water. And now, here I was, swimming straight toward my death. I kept repeating in my mind: I am a shark, I am a shark. But every muscle in my body was twitching, telling me to avert course, to at least try to save myself. There were worst places to die than the island of Bimini, I reasoned. The island was beloved by Hemingway, so at least it would have a literary angle (and relatively few witnesses). Out of the corner of my mask, I saw another shark dive below me and a third lurking beneath my floating body. I tried not to wonder why the rest of the party wasn’t yet in the water. I looked up to see the oncoming shark and realized I had to act quickly. Was I going to change direction? And I kept swimming forward. I picked up the pace. I wanted to collide (and meet my fate) sooner rather than later. The shark seemed to swim faster too. We were eye level, both of us just below the top of the water. I don’t think I’d ever fully grasped my own mortality until that very moment, when I fought every natural reaction in my body to change direction, to panic, to shriek for help. But deeper than this impulse to escape was the knowledge that if I were to lose control — to splash and cry for help — I wouldn’t survive. Finally, we were nearly head-on, face-to-face. Or jaws to snorkel. I needed to be near the surface so I could breathe air through my snorkel… what was the shark’s excuse? I was playing a game of chicken with a shark. What to do in this occasion? Politely swim below, so he could bite me and see if he liked the taste? Keep going straight? Punch him in the nose like I’d seen on Shark Week, or refrain from engaging in a fight I’d surely lose? I’ve never forgotten this moment, though I’m not sure what my lesson was, because everything feels so trite. That we’re all connected? That we’re all animals on this crazy, rapidly changing planet, just trying to survive? Or that maybe in order to be brave, you have to force yourself. Maybe to be a shark, you have to pretend you’re one already. Maybe such bravery can only be found when you don’t have any other options. It was instinctive. So, I suppose, here’s the lesson: The only way to overcome fear — and its crippling limitations — is to look it in the face and not flinch. To swim toward what scares you and have faith in yourself to survive. I kept the course, and as we drew closer, at the last minute, the shark dove down, just barely beneath me. His dorsal fin grazed the length of my body as we brushed against one another in the ocean. My entire body felt electric. He realized me. He saw me and let me live. And I saw him and chose to not be afraid. We coexisted. Maybe I was a shark. When I turned back to face the boats again, most of the sharks had vanished. By the time the people in the larger boat entered the water, none were left. Friends who’d witnessed my interaction with the shark from the safety of their boat thought I was crazy. Delusional, they said. Who swims right up to a shark? Which, to be fair, is a valid question.